I’m not sure if there are other options other than email and Push. It might be interesting to try an experiment where you make turn notifications tweets. I wonder if there are already any asynchronous games playable entirely on twitter. So, sending a notification immediately when it becomes the player’s turn is a must. I also believe it’s a “best practice” to time out your games, and send a notification before that happens. I know I’ve seen other devs (who host their own games) post about how not having async games time-out also means there are thousands of abandoned games on their server that will essentially never go away. So when this notice is sent could be based on the time-out period, maybe when the game would auto-boot them in another 24 hours. What Playdek has done is to allow the user who creates the game to specify a length of time for the game. This works like a chess clock, and the timer starts when you get the notification that your opponent has played their turn. (The options are 10 min, 30 min, 1 hr, 2 hrs, 1 day, 3 days, 7 days, 14 days, and 28 days.) They only send one push notification when it becomes your turn. If the game times-out, you only find out after you log in again. For Catchup, I’m using the simplest possible implementation of GameCenter, which is not to have timers at all. (Timers were only introduced in a later version of the API anyway, and I wanted to support versions of iOS farther back than that.) The way their push notifications for async games work is super opaque, (and they come from the GameCenter app, not your app, which is also annoying), and one of the biggest limitations of using GameCenter, in my opinion. One other thing I have seen, (but don’t necessarily endorse), is the ability for the user to nag the player whose turn it is. I can’t remember what app it was that did this, (maybe Trivia Crack? ), but there was essentially a button that you could press in the app to send a notification to the other player. I certainly don’t know what the best choices are, but I do know that there are different categories of asynchronous player with very strong opinions about how to play. For instance, vocal proponents of short timers who only want to play games that last less than an hour or so. Whereas I personally prefer to play games with the maximum timer limit, because, for me at least, I tend to batch all my asynchronous game play in one or two sessions a day. (And some days I skip entirely!) So player choice seems important. Yesterday I had the opportunity to play with Parse for the first time. (Essentially migrated a project from using Google Analytics to Parse objects in a day.) I never knew it was so easy, and I have to admit that now I sort of want to use it for an asynchronous game. We’ll see. Below you can find my slides from the presentation I gave at last night’s IGDA Twin Cities meeting. I think the presentation went okay, but I should have realized ahead of time how boring a topic spreadsheets can be. I saved the demos for the end of the talk, and by the time I got to them, I was really feeling the boredom radiating from all corners of the room. Anyway, I hope these slides are helpful to someone. While preparing for the talk, I came across an interesting article about the history (origin) of spreadsheets called A Spreadsheet Way of Knowledge. I’ve always just made games that I myself wanted to play, avoiding the entire camp of game design that suggests your players should be influencing your design. That may sound like an arrogant position to take, but at first it was borne more out of laziness and ignorance than anything else. Until I attended my first GDC in 2012, I didn’t even really realize there were people whose job was game design, and I certainly didn’t realize there were books written on it or — more importantly — people thinking about it academically. It was that revelation, more than any other, that has kept me going back to GDC; I find immense value in immersing myself in game design topics opinions and thinking for a week, not to mention all the networking opportunities. But anyway, aren’t I also a player? In my opinion, I’m a player whose wants and desires are seriously under-served. (That means my games are probably for a small segment of the market, and I’ve made peace with that. I’m not looking for commercial success… if it finds me, awesome.) I’m not going to cave to the pressure to make games for someone else. Because essentially I feel like that’s compromise. And I think compromise kills art. My vision is no more important than anyone else’s, but it’s also just as important as everyone else’s. And hey, I’m the one making it. So is this all one big excuse for not accepting constructive feedback? Partly, yes. These thoughts all come in the wake of showing off a new (-ish) board game last night at a local game designer meetup. I haven’t talked about this game publicly before, and this whiny blog post is probably not the place to start, but it was not received well. (In spite of many — at least 10 — fairly successful playtests previously.) Mostly, the feedback last night consisted of ways to change the game entirely, ways to take it in some other direction. Essentially, the playtesters (game designers, but for one) didn’t enjoy the game, and spent a good fifteen minutes after their play trying to brainstorm ways to “fix” the design. Almost all the player suggestions last night involved tearing up the design and making something new out of the pieces. This is something I’ve already done with this particular design at least three, maybe four times so far, and I’m actually very happy with where it’s at right now, so that option is not really on the table. It’s hard not to take this kind of feedback personally. (Made more difficult by at least one of the designers in question having a lot of problems keeping his feedback constructive.) The whole experience really threw me for a loop, and I spent this morning struggling against an impulse to just put the game away and not think about it for a while. Perhaps I can salvage this piece by adding a few bullet points about giving constructive game design feedback. Be thoughtful — Generally speaking, think before you speak. As best you can, it’s a good idea to form complete thoughts before you speak them. If you’re offering up specific “fixes” for a perceived issue, make sure you articulate that issue before you offer up your solutions. Think about why something is a problem before you say it’s a problem. General “impressions” are generally not that useful, better to back them up with a “why” or a “how”. Be courteous — Nothing invalidates your feedback quicker (or makes it harder to hear) than an insulting statement. Make sure your feedback is about the game, and cannot be construed as a criticism of the designer. In general, if it’s not nice, try hard to think of a way to say it nicer. Context is everything — Ideally the game designer has asked for specific feedback points, but even if not, it’s probably worth asking some probing questions before getting into a torrent of specific criticisms. There are several “levels” at which you can talk about any game. Is the designer looking for feedback about the overall systems used in the game, or are they looking for feedback about specific components or balance issues? Be specific — “I did not like this.” is not, by itself, useful feedback. Generally speaking, the more detailed you can be about why you didn’t (or did!) like something the better. If the designer was paying attention, they probably already know whether you were enjoying the experience. Stay on topic — I’ve found that “after playtest discussion” can easily veer into a speculative realm of what-ifs and imaginary games that could exist. This is especially true with game designers. Try not to be the one leading the discussion away from the current game. Workers was initially conceived as a “born digital” board game with the central mechanic that there are a variable number of “resource pools” in the game, and every round each pool’s count of available resources is incremented by one. 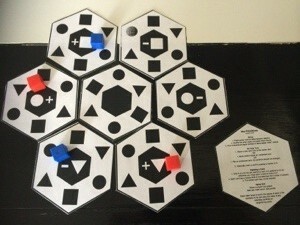 The name stems from it being a very light “worker placement” game, with the initial version allowing for only one action taken (worker placed) per turn. I’ll get into the various specific actions available when I go into details about each version of the game below. The only other shared mechanic for all the versions of the game has been the turn / round mechanism. 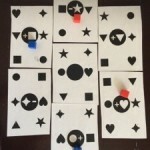 Each round a starting player is indicated, every player takes an action (or two) for their turn in clockwise order, and then the starting player indicator is passed to the next player (also in clockwise order). The initial version of this game remains the only one for which there is a (completed) digital prototype. I completed a very quick and dirty app to “prove out” the game mechanics in an evening or two of work and subsequently sent it to some of my TestFlight users for feedback and testing. The prototype was “successful” in that it convinced me more work was needed, but ultimately had quite a few design flaws, which I’ll detail in a minute. As you may or may not be able to understand from the screenshot, there are 5 available pools of resource (yes, a hard-coded number, even though I knew from the beginning that I wanted it to be variable), as well as hard-coded two-players (with their resource counts on either side of the screen). 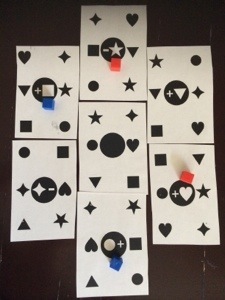 In the center are all the available actions, and under the main resource pools (which double as buttons for taking the corresponding collection actions) are action buttons for selling each combination of two resource. 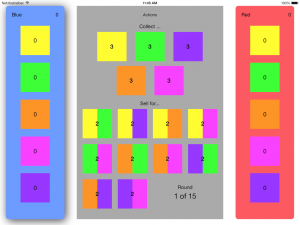 This version has a selling mechanic whereby you can sell pairs of different-colored resources for the value shown on each pair. Between rounds, not only do the number of resources in each “pool” increment, but the point values for selling each combination are also incremented every round. When a player took a selling action they automatically sold all possible combinations of the two resources for the point value shown. (So if they had 3 green and 2 blue, and took the green/blue selling action when it was worth 5 points, the would end up with 10 points and 1 remaining green resource.) After a sale action, the value for that combination is reset to zero. 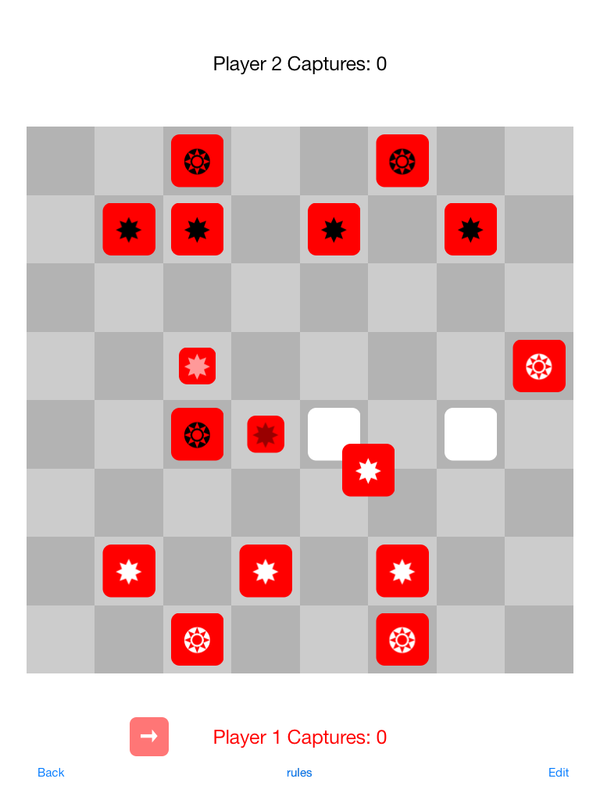 The next version of the game was conceived to “solve” some of the design problems in the fist game by adding variability (via a game board), as well as removing the complex in-game scoring (the entire “selling” mechanic). I don’t remember whether removing in-game scoring was a goal in and of itself, or whether it was primarily meant to facilitate paper prototyping. I took this version to my first Game Designer Sessions meetup, (quite a number of months ago). 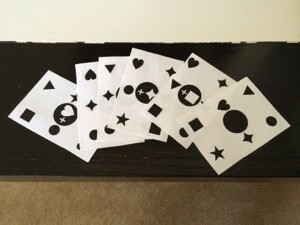 The game was played at that time with decks of cards with different colored backs for each resource pool. 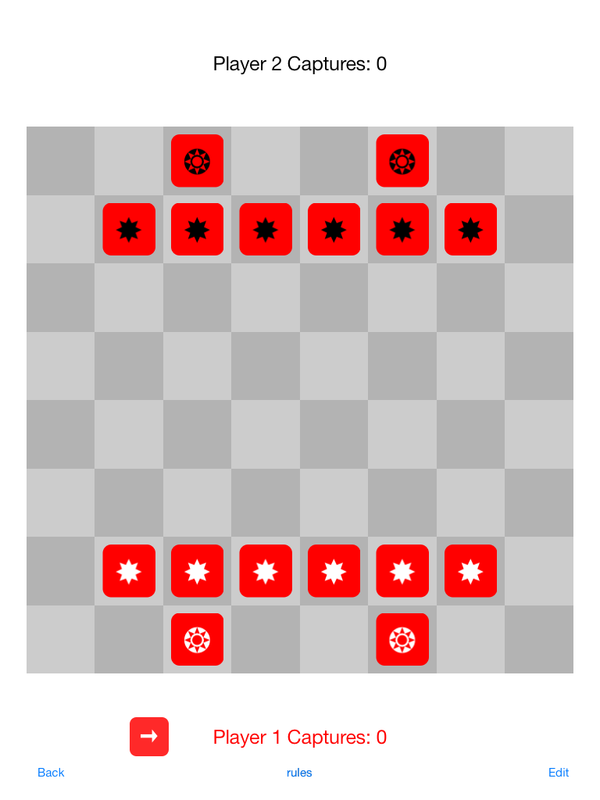 The “game board” consists of an empty grid at the beginning of the game. Grid dimensions (as well as “number of resource pools”, “starting player resources”, and “starting resources in each pool”) are meant to be variable for each game. Scores weren’t known/calculated until the end of the game, when all the spots in the grid were filled with resources. I played with a couple of formulas for scoring (see below), but in general, I wanted the more groups and the larger the groups to have higher point values at the end. One issue became evident right away, and that was lack of incentive to be the player who plays onto the game grid. After one play test, the player who sat back and hoarded resources was the clear victor. If I remember right, I believe we played a second game after the first and changed the “play on the board” action to take the resource from the pool rather than from your hand. Additionally, you got to take one resource from the pool into your hand as part of that action. I came up with another possible solution on the fly last night. We played a relatively quick game with 4 players, 4 resources, and a 4×4 grid, but less than halfway into the game I remembered the problem discovered in the playtesting of Workers II. I let the game play out, but suggested we play another game where you take two actions per turn, but your second action has to be a placement on the game board. One player left, so we played 3-players, 4-resources, on a 4×4 grid, but everyone started with one of each resource. I feel like this went pretty well, but still “needed something”. I have lots of ideas for Workers IV. I’ll post back here when I get a chance to try any of them out! I’m not really interested in commenting on the F2P mechanics, (since enough has been made elsewhere of how “gentle” they are in Hearthstone, or how “right” Blizzard is getting it), I’m more interested in a study of the game mechanics independent of the monetization strategies (no matter how closely they may be coupled). 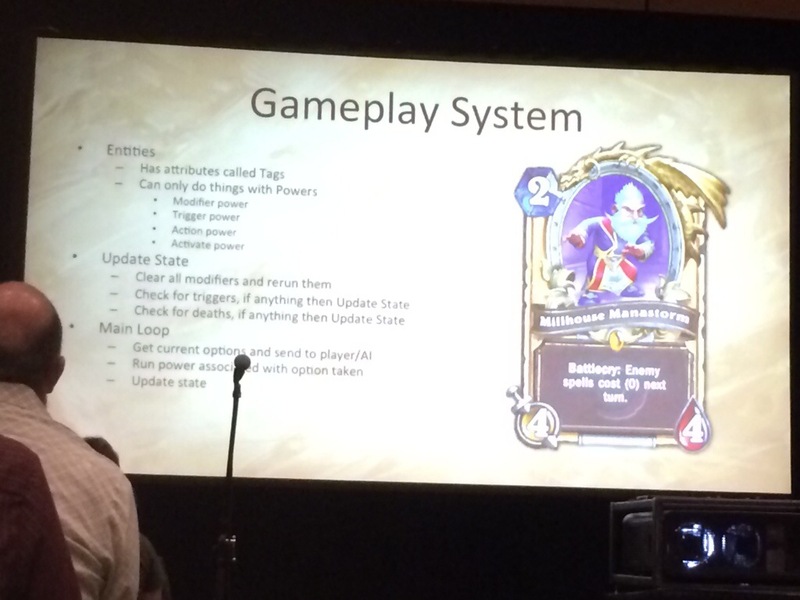 From what I saw at GDC, Blizzard really spent a lot of time trying to make Hearthstone accessible to the masses. This manifest in a lot of different ways, but essentially they are balancing card abilities and deck compositions (for pre-built decks you encounter and use early in the game) to help new players. I never really got into Magic the Gathering. I know there will be some of you that stop reading at this point, but I guess what turns me off about it (and, realizing this, the entire genre of deck-based-fighting-games) is the direct conflict. Most of the card abilities deal with combat. Dealing damage to your opponent is a (if not THE) central mechanic, and I guess I just find that emphatically boring. A month or two ago, I did get pretty into Card Wars, a LLG (CCG?) inspired by an episode of Adventure Time. It was a great episode, and made everyone who saw it (well, everyone I’ve talked to) want to play the game. It’s a lane-based game like Solforge, Spectromancer (or it’s sort of predecessor Kard Combat), or Kongregate’s more recent Tyrant Unleashed. I guess this is another one of those posts where, if I had infinite time, I would dissect the mechanics I like about each of these games, and draw a cool diagram or something, but I don’t have the time, and I’m going to go download Hearthstone now, before I forget. As a sort of follow-up to yesterday’s post on small-grid games, I realized that I haven’t made this pair of games public anywhere yet. (That I remember.) That post led to some Facebook discussion, where we got to talking about hex grids, and I mentioned that I haven’t seen any small hex grid games… but then I realized that I had worked on a design for one on-and-off last year! 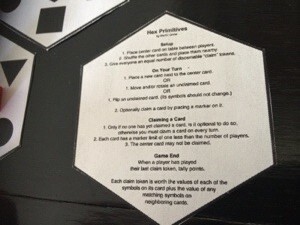 The first version was played with standard playing cards in a hex-like configuration. But I realized I could get more symbol matching in there (and more rotation) if I switched to hexes for the cards themselves. I also went from six symbols to three, for essentially the same reason. 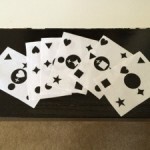 Here are some photos of various paper prototypes. These games were inspired by my playing Love Letter for the first time, and wanting to design a game that used a similarly ridiculously small number of components. (Love letter is played with a deck of 16 cards. Primitives is played with only 7.) I may try and bring this game to a Game Designer Sessions meetup tonight or in the future. tl/dr: I just submitted an app version of a board game I call Root Down to the app store. The app will be free, and represents not all that much effort on my part, but if there is interest, I’d like to update it with AI and multiplayer. 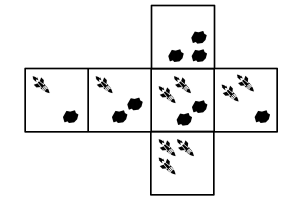 Root Down is a 2-player abstract strategy game where the main mechanic is that pieces flip from a state where they can move (kickers) to a state where they cannot move (roots) after every move. 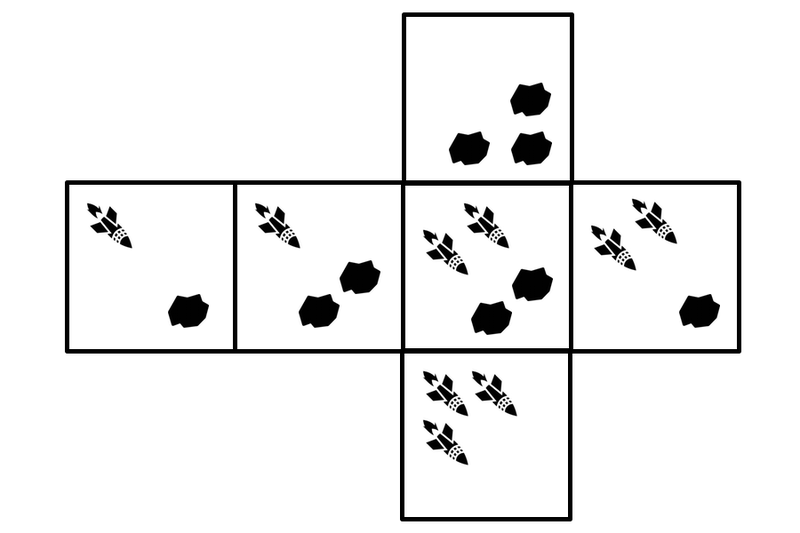 The key is that kickers must also be next to a root in order to move, and the number of spaces they move is also determined by the number of kickers next to each root. I spent an evening and adapted the game for iPad, and have now iterated on it a couple of times to the point where I think I’d like to get it out there and see if there is additional interest. There is no AI, and the game can only be played on an iPad with two players. Consequently, I can’t imagine it will get that much interest, but I still want to put it out there and see what happens. The full rules for the game can be found in this public google doc. an edit button on the game screen — This allows you to change the opening setup, and initially I thought it would be useful as a “poor man’s undo”, but it can’t undo capture counts, so it really doesn’t work for that. a feedback button — This just opens the standard email popup. an Abstract Puzzle logo that fades out to the home screen — This doesn’t look as good as I wanted it to, and I’m still debating pulling it from the next build. The problem is that I didn’t have a version of the logo with a transparent background, and the black on red ended up just looking okay, but not great. Apple rejected the first version because they didn’t like this bit in my app description: “This is an app experiment. There is no AI (yet), nor are there the other typical bells and whistles usually present in iOS board game conversions. If there is interest, I plan to add an interactive tutorial, asynchronous multiplayer, an AI to play against, universal (iPhone) support, and whatever other features are requested.” I removed all of that, and replaced it with a call to use a “submit feedback” button on the app’s menu. Subsequently, (this morning), I found a bug in the end-game scoring. I’ll be rejecting the binary, and resubmitting in the next hour or so. 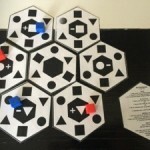 A month or so ago, Christian Freeling (creator of Mindsports) started a contest on BGG in the Abstract Strategy forums concerning “activator” games, or games with pieces that “activate” other pieces. The idea percolated in my brain a bit, and suddenly I found myself on the floor with my copy of Card Chess, playtesting an idea or two. I got enamored enough with the game that I wrote up the rules, and wanted to post them on BGG to get feedback, but I didn’t have a name. I started thinking about the pieces in my game that activate, and how they sort of put out tentacles to the pieces next to them, kind of like roots on a tree. Eventually the Beastie Boys’ Root Down popped into my head, and the name was set. Eventually I re-wrote the rules to incorporate “roots” and “kickers”, and “kicking it root down” from the lyrics of that song. I think it works pretty well, actually, for an otherwise themeless abstract. Eventually, I did post the game to BGG. I have also submitted the game to the actual BGG database, where it is pending approval. When you consider some of the game design imperatives for mobile games — playable in short bursts, interruptible, simple touch controls, UI that fits on a small screen — you may not immediately think that board games are a good fit for the medium. After all, many board games are an all-evening affair, require complex strategies, and cover the dining room table while they’re being played. But there are several reasons that board games are extremely popular on mobile, even games without the marketing budgets and brand recognition of Monopoly or Chess. First, it should be noted that these are games with an existing fanbase. With a few notable exceptions (see Solforge or Cabals: The Card Game), mobile board games already have a physical version. This means that there is a certain niche fanbase that probably already knows about the game. Quite possibly there are hundreds or even thousands of people who have already played the game and know its rules. Some games already have enthusiastic fans that will help promote a digital version without even playing it. As anyone with a marketing background knows, the more times a person sees a product, the more likely they are to purchase the product. So a fan of board games might have seen it in their local hobby store or read about it on Board Game Geek. By having a digital version on the market, your game has a leg up on the competition by sheer virtue of name recognition. In fact, this cross-media marketing can go both ways. Notable board game publisher Days of Wonder has been fairly public about the boost in sales their game Ticket To Ride has seen when the app version goes on sale or is otherwise promoted in the app store. Price point is also worth talking about, as most hobbyist board games cost between $20 and $60, and most mobile apps cost between $0 and $1. A board game conversion application can often command above-average “mobile market value” (usually between $3 and $10) simply because it is being compared to the price of a physical game that is priced considerably higher. To a hobbyist board game connoisseur, picking up a $5 app to “try out” a game that would normally cost much more is quite a bargain. If the game includes a tutorial (as it should! 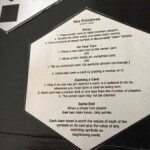 ), it might even attract a secondary market in players of the physical board game who can’t, or won’t, be bothered to read a complicated instruction manual. All of this should not be interpreted to mean that you can ignore the mobile game design imperatives mentioned at the beginning of this article. In fact, those should be some of your primary considerations when you evaluate converting a board game to mobile. Can you shrink all the information onto a 3.5-inch screen? Can you adequately distill the strategies and experiences of playing that particular game into a single-player experience, and will that experience still be fun? Sometimes the answer to that last question is only maybe, or flat out no, but mobile has another compelling attribute that will allow the game to still be worth making: always-on internet! This means it is perfectly possible to make a mobile game that is multiplayer only. There have been some really successful examples of this, (Words With Friends, for example). Another important question is whether the game can be played asynchronously. What I mean by this is: can each player take their turn without needing the input of the other players? If so, this allows for non-realtime (asynchronous) multiplayer and vastly simplifies the implementation of single-device multiplayer. I would still recommend you include a single-player experience if you can swing it. The main reason for this is related to the cross-pollination I mentioned earlier between physical and digital. Folks who already own a game will have less reason to pick up a digital version if it is multiplayer-only. Sure, they can play against strangers and over long distances, but it is incredibly compelling to be able to play a board game you enjoy without needing to wrangle up several friends to do so. Some mobile board game publishers claim that their usage stats also show more single player games played than multiplayer, but that is highly anecdotal evidence. Another question to ask is: does anything need to change when going from physical to digital? Should you use the art from the original board game? (If you can, the answer to this one is absolutely yes.) Obviously, you don’t have little wooden bits to move around, but of course you could simulate those. What if the wooden bits in the game are just counters? Would it make more sense to just show the number they are meant to represent instead of showing the pile of wooden bits? Anything that can be represented numerically is something you should contemplate. I’ll illustrate this with an example from one of the first (and still one of the best) iOS board game conversions, Carcassonne. Carcassonne is a tile laying game, where on your turn, you have a random tile to play. In the physical version, you randomize by making face-down stacks of tiles or by pulling one from a bag. Theoretically, you know how many tiles there are left “in the bag” (and even what kind they are) by counting the ones already played on the table. In practice, that’s rarely something anyone figures out when playing the physical game. Yet, in the digital conversion, the developers chose to show a list of all the tiles in the game, with the number remaining of each type clearly displayed. 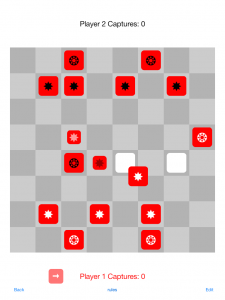 This simple inclusion immensely changes gameplay because players will spend less time trying to determine whether or not a particular tile will be available to them later in the game. This allows for a much more strategic playing of the game. I don’t have space here to go into all the nuances of licensing a board game property for mobile conversion, but I will say that you can bet most of the more popular games have either already been licensed, or have some other reason for remaining unlicensed. There are thousands of board games, however, and there are many, many diamonds in the rough. Likewise, I could write an entire article about UI considerations. How to best represent physical components on a touchscreen device is question that has been answered many different ways already, and only a few great games have really nailed it. A few board games have now been released simultaneously with their digital counterparts. Marketing a board game is not so different from marketing a video game, and platform dominance applies to both. There may come a time in the not so distant future when we expect these simultaneous releases. Perhaps someday, digital “conversions” will not be considered “conversions” at all, but rather, just another way to play the game. Note that I originally wrote this article for the IGDA Perspectives Newsletter, and it was posted at the end of November along with the following bio (which I also wrote, just FYI). Martin Grider has been developing iOS applications since late 2008, when he launched his first application ActionChess, a Chess and puzzle game mashup. At the end of 2012, he developed and helped launch For The Win, an iOS board game conversion for well-known board game publisher Tasty Minstrel Games. Martin is passionate about mobile game development as well as game design for both video games and board games. He is a proud member of the IGDA, where he has presented for the local Twin Cities chapter on iPhone Game Development, Mobile Game Design, and his own mobile games. This project came about while I was joking yesterday afternoon with my friend Patrick about how we needed to rush a space-themed dice game to Kickstarter before TMG publishes Eminent Domain Dice. I’m still working on my deckbuilding 4X game, so 4X mechanics have been on my mind a lot lately, and the more I thought about it, the more I actually thought a 4X dice game could be pretty cool. Right away I had the idea that you would take your actions at the beginning of your turn, then roll the dice to plan out your next turn’s actions. From there, the game practically wrote itself. I went to BGG to post my rough draft of the rules (without any graphics or pnp files), and before I got that far, I discovered that the theme for this month’s 24 hour game design contest is dice. Well, that seemed awfully convenient, but reading through the rules, I’d have to do everything myself, prototype art and all… so I did. So without further ado, here are the rules (and PNP pages, including custom dice in two sizes), for my new game, which I am tentatively calling 4X Dice.